My Outside Voice: Meal Plan Monday! A Day Late! Meal Plan Monday! A Day Late! Yesterday was just too too busy and the day got away from me! But here is our plan for the week! Plans - Final JLM Committee Meeting for the 09-10 year! Dinner - Depends on where I am. If I work from home, then it will be black bean and ham soup, otherwise we will have to see. Plans - Wine Club "A Tour through Willamette Valley"
Plans - Kentucky Derby Day!!!! Couples Wine Tasting "Under $10 Tasting"
We really have not been cooking much lately, but I am sure that will change as the summer goes on. 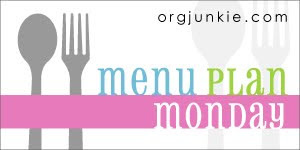 For more meal plans and links to recipes, check out the Orgjunkie.